I’ve realized I kind of need to get over that though, as things just seem to accumulate too fast to have every single area perfect at all times! 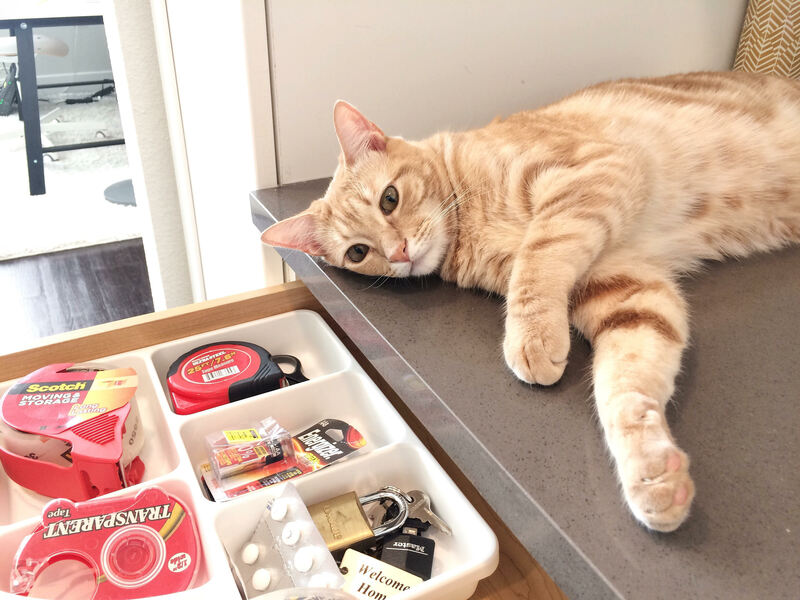 So, I knew the main key for taming this drawer was mainly just to have a spot for everything as much as possible, so it will be somewhat “contained clutter”. Here is the before of this crazy drawer! Ahhh! The stress! Everything in it had basically been building up for about a year, so it was high time to do it! When I was working on organizing my desk a while back (should have that post up by next week, hopefully!) 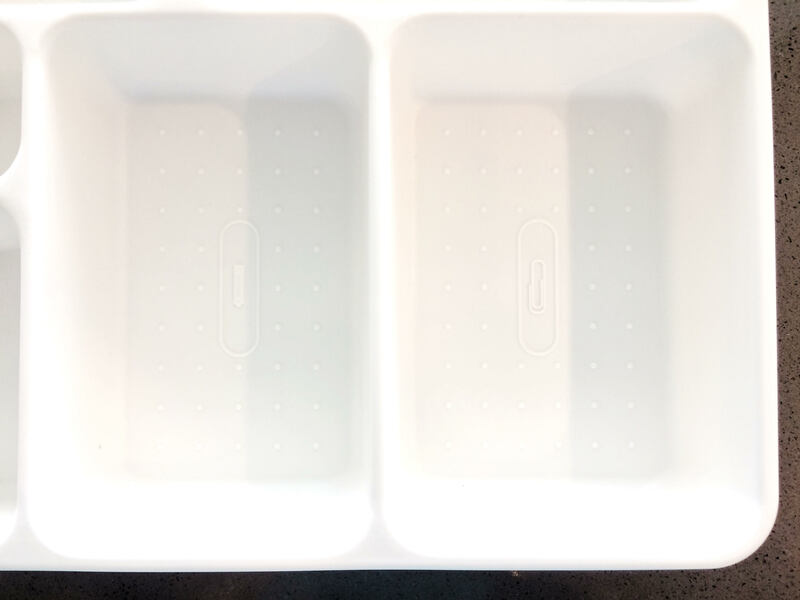 I came across this super nifty drawer tray at Target. 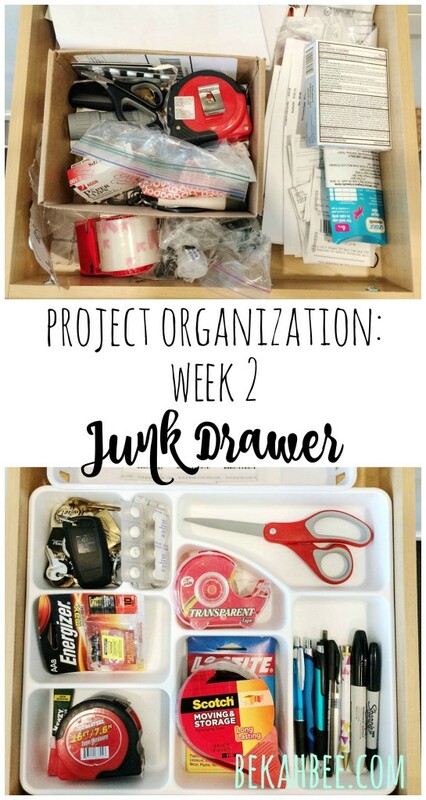 It’s called the Junk Drawer Organizer (fitting!) 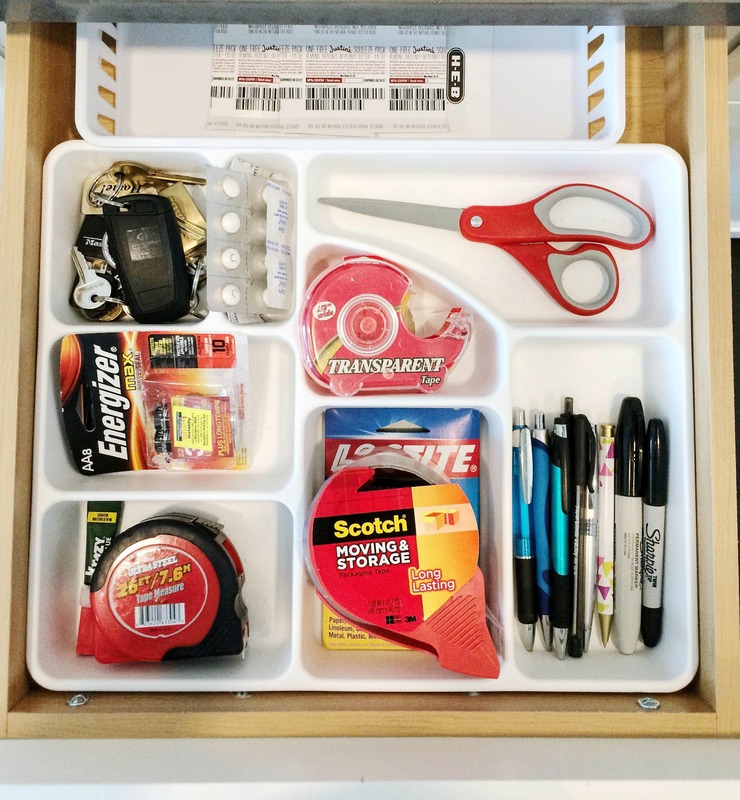 from Room Essentials, and it ended up working so well for me in my desk drawer, that I knew I needed to get another one for this drawer. 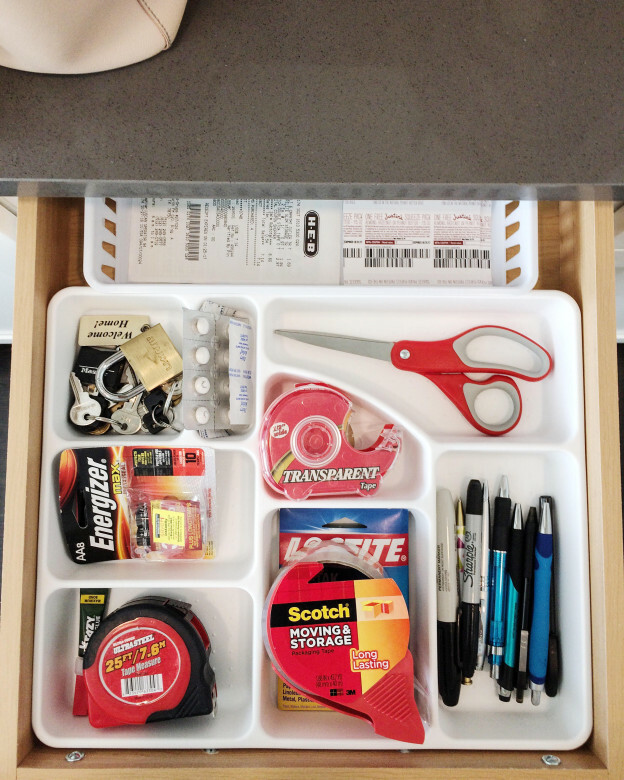 What makes it so cool is all the different size dividers, each one is intended for a common junk drawer item. If you look closely at this shot, you can see that the recommended item for each section is shown on the bottom. On the left is the section for batteries, and on the right for paperclips. I wasn’t sure I liked that detail at first, but it has really grown on me since it was actually pretty accurate for what fits where, and you can’t see it anyways after you put things inside each slot. The scissors and tape sections are my favorite, since those things are awkward shapes and they fit pretty much perfectly inside! I guess he got a little tired out from helping out! 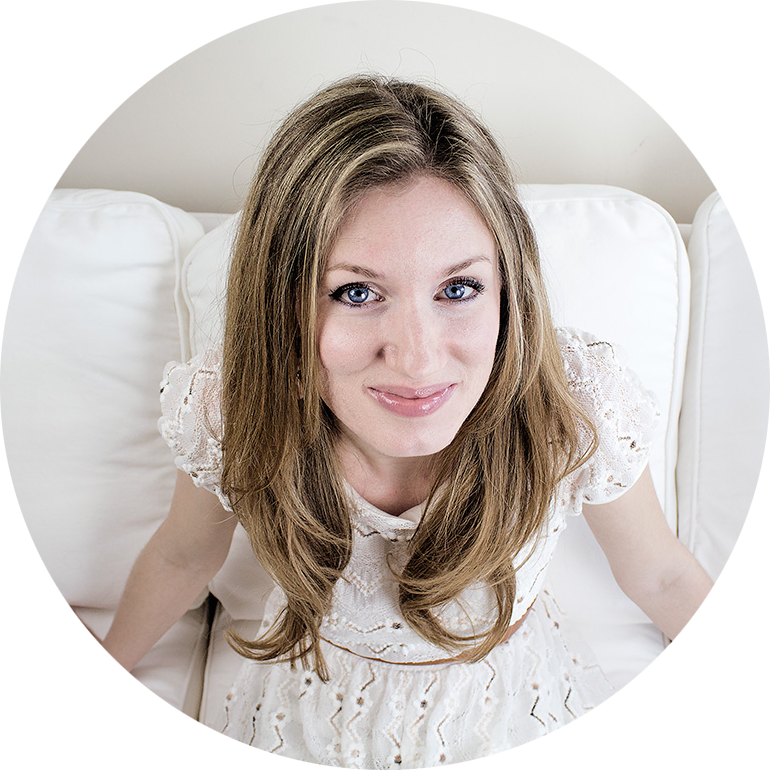 And drumroll please….here is the after! 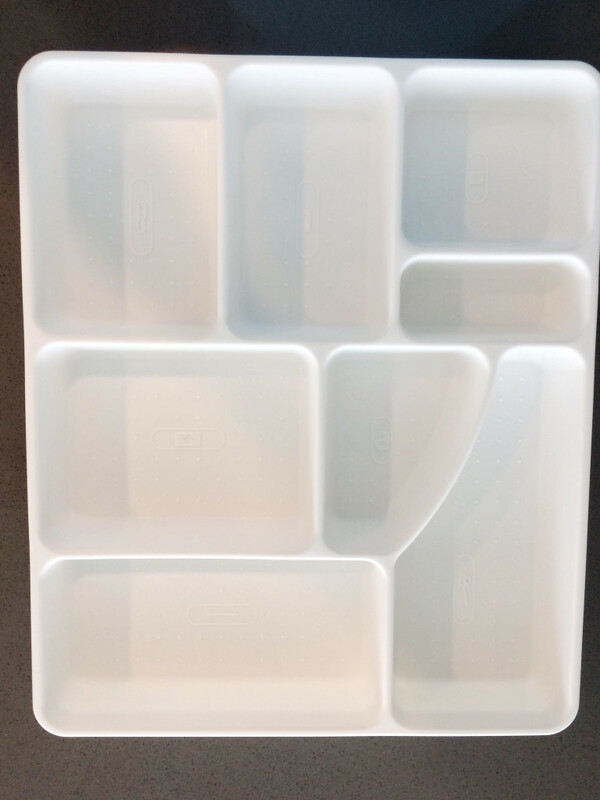 I decided to turn the tray sideways and it fit perfectly that way. There was just enough room behind it to put a long, thin basket. I am using that to store receipts to keep long enough to make sure things don’t need to be returned, and misc. coupons. 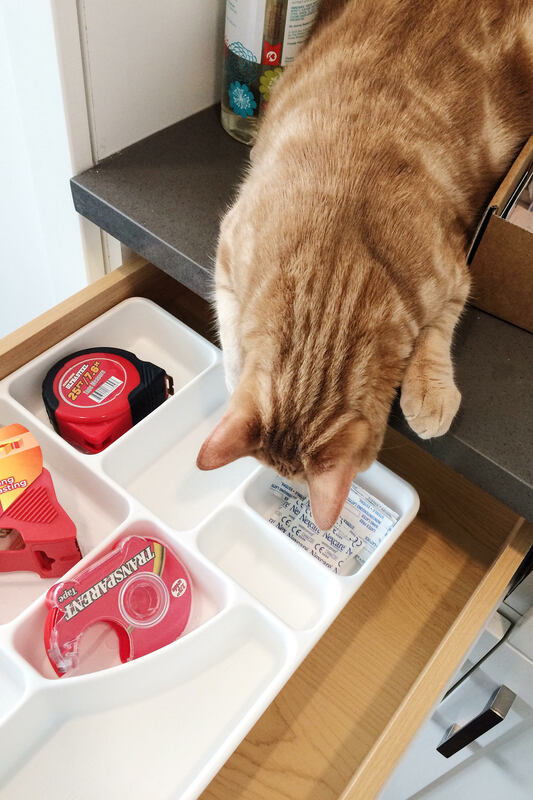 The thing that piled up the worst in this drawer was always a bunch of receipts, so I wanted a specific place for those to stay neat & tidy! 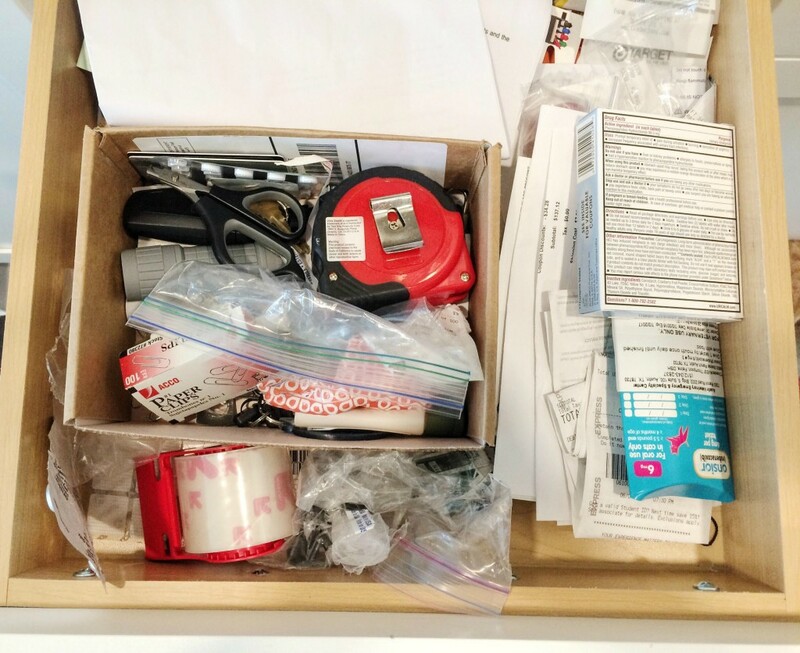 I LOVE that nothing slides around in this drawer now when I open it, those little details all add up to less stress and a better quality of life! If you haven’t seen them yet, check out my other projects so far, my bathroom/linen closet and my hallway nook! So, here’s a random and fun question! Do you use the term “unorganized” or “disorganized” to describe the opposite of organized? My hubs always gives me a hard time when I say disorganized, but I just looked it up and both are proper words that can be used in certain situations! Just one of those funny things I wondered…so I’d love to hear how you say it!